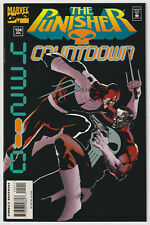 Punisher #4. I have graded the comic book, using the Oversteet Grading Guide, at VERY FINE. item 6 The Punisher #1 (Jan 1986, Marvel) Wear Fair Condition FAST SHIPPING! -The Punisher #1 (Jan 1986, Marvel) Wear Fair Condition FAST SHIPPING! item 7 MARVEL: THE PUNISHER #1-5, COMPLETE SET, NETFLIX SERIES, HOT, 1986, VF/NM (9.0)! -MARVEL: THE PUNISHER #1-5, COMPLETE SET, NETFLIX SERIES, HOT, 1986, VF/NM (9.0)! The comic has some pretty bad lines on it the picture does no show or is described in the description.